Let me share with you a familiar-sounding story. As a rookie back in 2016, Zach Eflin wasn’t good. There were 181 starting pitchers that year who threw at least 50 innings, and only two of them wound up with a lower strikeout rate than Eflin did. And then as a sophomore in 2017, Eflin wasn’t good. There were 189 starting pitchers that year who threw at least 50 innings, and only four of them wound up with a lower strikeout rate than Eflin did. Yes, there’s more to pitching in the major leagues than generating strikeouts, but Eflin didn’t have anything going in his favor. So he showed up to camp this past spring feeling especially optimistic. In February of 2018, Zach Eflin felt like he was in the best shape of his life. Admittedly, the story had some substance. Eflin had felt knee pain for most of his life. After the 2016 season, he had surgery to repair the patella tendon in both of his legs. That was good for the pain, but bad for his strength. Eflin didn’t get to have a normal offseason, and he pitched while underweight. The idea this time around was that Eflin would be able to use his lower body. Over the winter, he added something like 20 pounds of muscle to his legs. It all sounded good. But then, best-shape stories always sound good. In the moment, it’s impossible to know who’s going to be better, and who’s going to be the same. Well, Zach Eflin isn’t the same. He isn’t the same, for the reasons just stated. He’s got the same strikeout rate as Chris Archer. He’s got the same strikeout rate as Jose Quintana. He nearly has the same strikeout rate as Aaron Nola. Eflin is pitching to keep a rotation spot. But in the bigger picture, it’s like Eflin is debuting all over again. His career simply had a false start. This is a sample numbering 122 starting pitchers. Eflin’s strikeout rate is up 11.3 points, which is the second-greatest increase, behind only Gerrit Cole. Cole has gone from good to dominant. 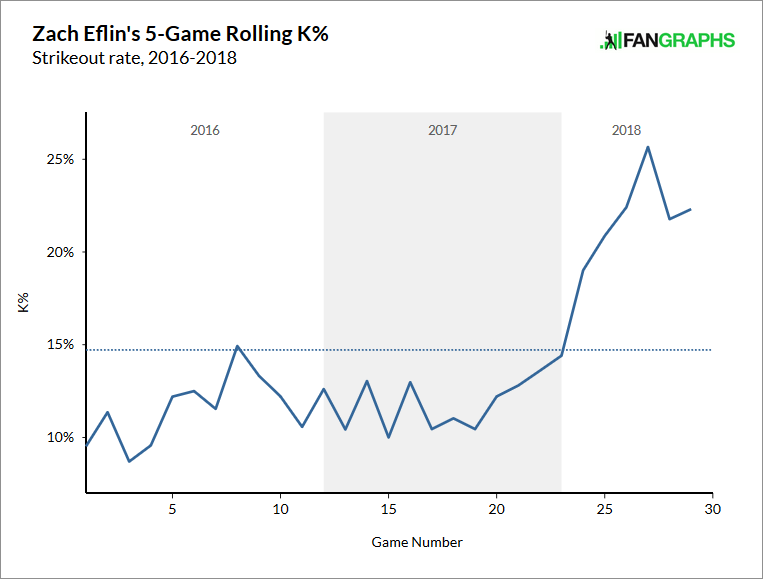 Eflin has gone from mediocre to good. Not every breakout has to involve a guy becoming an ace. Eflin is just looking like a major-league starting pitcher. Not bad, for someone originally thought to just be holding a spot for Ben Lively or Jerad Eickhoff. 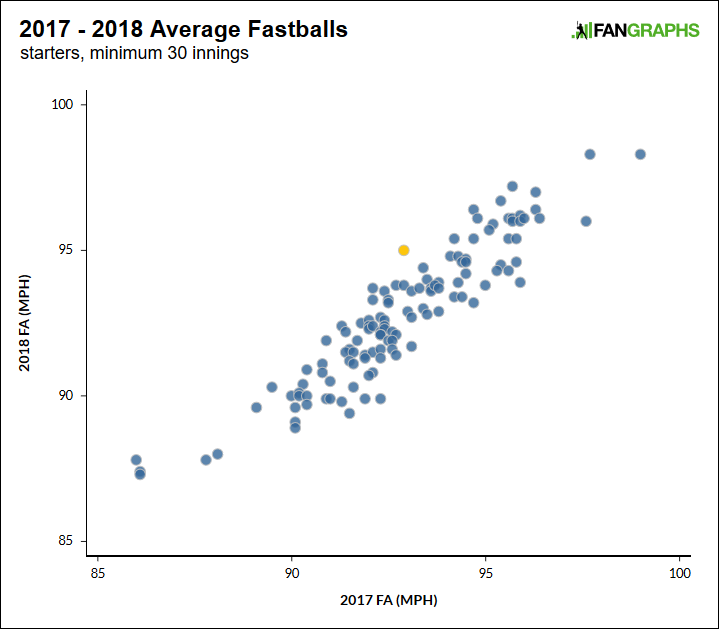 Eflin’s fastball is up two miles per hour, which is the greatest increase in the sample. From time to time, now, he can get up to 96, and with the added zip, Eflin has gained added confidence in his four-seamer. As a rookie, Eflin’s four-seam fastball accounted for 34% of his strikeouts. The next year, 28%. So far this year, 58%. Eflin is better at getting to two-strike counts, but he’s especially better at turning two-strike counts into three-strike counts. Eflin is stronger, and healthier, and as a consequence, he’s learning more about his own capabilities. He doesn’t have to pitch to contact anymore, because he’s sufficiently talented to be better than that. Within Eflin’s delivery, you can see the difference his stronger lower body has made. His emergence is about more than just his stronger legs alone, but that’s been the foundation for everything else. Here are two screenshots, from Eflin’s last home start in 2017, and from his game on Sunday. Conveniently, both times, there’s been a stripe on his pants. Eflin’s four-seamer stays arm-side, up, and his sinker stays arm-side, down. His changeup, too, stays arm-side, down, with his slider diving to the other side of the plate. 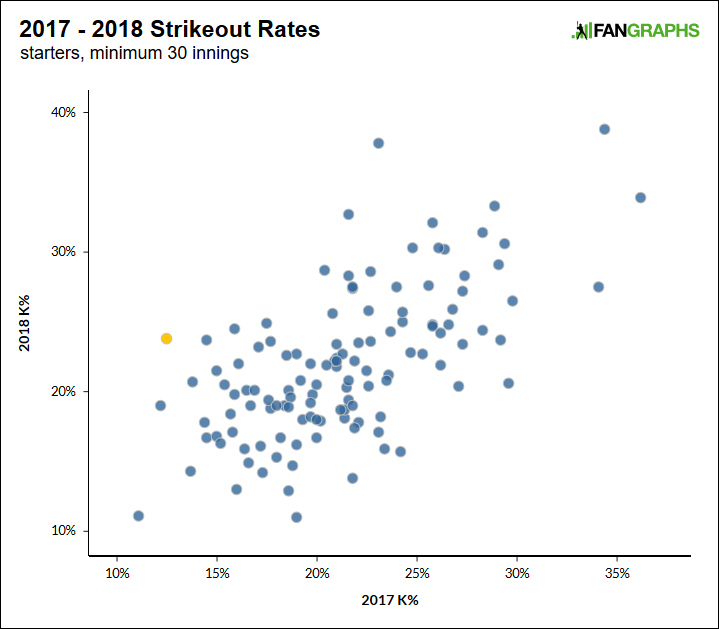 Eflin himself would probably tell you he still has more work to do to improve, and he doesn’t, for example, have a good pitch to get in on a lefty’s hands. But this is still so, so much better than it used to be. It’s not just the premium players responsible for the Phillies hanging out in the race. Eflin’s going to need to keep pitching well, because Eickhoff and Lively will want spots of their own. Eflin won’t automatically get the benefit of the doubt, like Aaron Nola would, or like Jake Arrieta would. But there’s something appropriate here, since Eflin was acquired for Jimmy Rollins in what might’ve been the first rebuilding move those Phillies made. The Phillies are arriving, with all of their talent coming together. The same could be said of Zach Eflin, who for the first time as an adult can comfortably place his trust in his legs. All of that faith gets channeled up to his arm. We hoped you liked reading The Phillies Have a Brand-New Starting Pitcher by Jeff Sullivan! Is Major League Baseball’s Domestic Violence Policy Working?